Hello Mr. Prosect. Can you please introduce yourself to the readers? 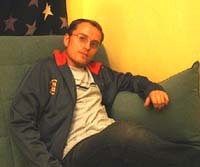 Good evening, my name is Andy, born 1983 in Ukraine. In age of 10 my family moved to Israel, so nowadays I’m based in a small southern city named Dimona. Since my early childhood I’ve got connected to electronic music, when I discovered psytrance it was the most original and open minded genre for me, so I hooked up in no time. Started with musical experiments by the end of 99', after some period I’ve noticed that I did a mistake - as more as I was getting into it, into the world of endless sounds and ideas, my passion to music creation grew up and nowadays I just can't find myself without it. Music became a part of my life. What is the meaning of your artist name? My artist name basically has 2 meanings, the more complicated one is Proton Sector; which best can be described as an area of positive energies. Music that comes out of my project should supply you with positivity, people should smile inside of them (soul) and outside through their body (dance). The second meaning is more basic one: pro-section, pro stands for something advanced and section is my sound laboratory, this is where I’m trying to get more advanced then the others, learning and developing - this way it is endless. My music can be best described as psychedelic trance. I’m not much into categorizing all those subgenres but my music travels inside and outside the whole psytrance spectrum. I try to be progressive, I love to get back to the roots, I love to experiment , I love to go into different corners of the electronic music, also I got this noticeable funky elements almost in all of my creations. I have to be innovative, original and fresh - that's the basic rules to find my own way on the scene nowadays. I think my music is energetic and danceable; but on the other hand it could be freely played at home. What were the crucial events that made your music what it is today? What artists influenced you the most? My music slowly developed into the music that I do today, I’ve started with goa trance sounds at first because the technology and my musical curiosity probably lead me into that. 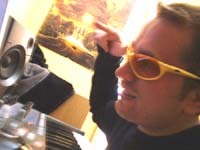 On the psytrance side I was influenced by the CDs I bought from Twisted, TIP, Matsuri, Flying Rhino and the Blue Room. On the other side of me I was still listening to artists like The Prodigy, The Chemical Brothers and other electronic stuff. How would you describe the current state of the electronic music scene in Israel? Is it getting more open-minded or is getting fragmented into different streams that do not co-operate one with another? Well, I guess the Israeli scene is not much in movement and it stuck with one main genre that is known as "Full On", this genre controls most of the scene. This genre is the most appreciated by the newcomers and the youngest generation. Lately the Full On direction started to cooperate with the Progressive one, you can see it not only in Israel, Progressive projects getting more energetic and have a few Full On elements in their tunes and vice versa. I dig some of the Israeli artists which I think sound different. Just to name a few: Violet Vision are supreme and Sub6 also know their job. You have a lot of aliases and collaborations, can you please explain how you decide under what name which tune will be published and what are your current projects? Yes, all that aliases come from the fact that I mentioned before - my head is full of visions and I’m very multi-styled. Collaborations with different artists is a very good tool to get a new spice to my music, new ideas, it is always great when you're out of muse. It's easy to decide - psychedelic trance under my main alias "ProSect" and more deep and house oriented music under the new alias "Sonify". 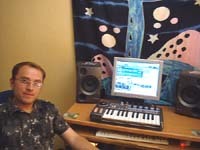 The other 2 projects I got are mainly for collaborations; "Sound Field" is collaboration with Liron Atia ("The Poofs"). We got same vision as the ProSect project - psychedelic trance with a progressive view on things. "ICO" which stands for Imagination Corporation is the project where I go free-style, it can be breakbeat, it can be ambient and it can be anything with the soft psychedelic touch. In this project I collaborate with different minds I meet, each one is unique. What is your typical workflow? How a tune of yours becomes alive? There is no typical workflow. It depends on the mood and the state of my inspiration. Mostly it starts from a groove, which is a bassline, the kick and the percussion. After I got the groove I’m starting to build add-ons which can be synth lines, effects or any other "side" sounds. Then I do the "peak" of the track, that's where the tune goes to, that's the point where all points will be set. While working on the structure many elements can be removed and new ones will fill or find a new place. Pretty tricky method, but works for me. Usually the name of the track comes first or at the first levels of the creation, the name co-operates with my visions on that track. A lot been said about the typical Israeli sound, that artist here prefer to copy each other rather than try to mold their own sound. Do you personally try, in spite of a multiple collaborations you are part of, to create a unique sound or do you see yourself as a part of the local scene with a typical local sound? Through the small amount of years I’m in the music craft, I think I developed my sound and not only one. I haven’t changed it due to commercial requests and I hope that I will not. I trust my intuition and I believe that self-expression is much better for self satisfaction and of course I hope that the listeners out there will be satisfied from my musical messages. Many of the current Israeli Psy Producers/DJs are immigrants from one of the former Soviet Republics. Do you think there is some sort of a connection between being immigrant and being into psy trance or is it just a statistical probability? The Russian Mafia is everywhere... Hehe... Well, honestly I got no idea, do you? I think I’m going to find myself immigrating again in the future, so I will reduce a bit the statistics. What do you think about the MP3 format? Do you think it promotes you as an artist or do you think it stands on your way? It's good and bad. The future is here, no way back... Instead of complaining and blaming the internet mostly on the low sales, people should think about smart solutions. Of course it's a fast and good promotional tool, but as long as it hurts the labels which are needed for us, the artists, it hurts us all. Producing quite diverse and unique music like yours can get you easily in the between the chairs. How do you present yourself to the label managers? Do you think that the aim of too many of today’s labels to stick to their own sound is being an obstacle for new producers like you? Do you have any advices for the young producers out there? Some tips on how to deal with labels and how to promote themselves? I, myself, am a newcomer. All I can advise is to think twice before getting into it - to think if you will be spotted from the big amount of the artists. And not to dream of living out of it, the way is a long one for that, especially in the psytrance genre. To finish the army, to travel a bit. I am also thinking about leaving Israel due to personal reasons and maybe to study something interesting. On the musical side I want to prepare live sets and start to play for the crowds; work on my projects - and as I see it today, it will be mainly on Sonify. Also I got enough material for a ProSect album so that's an idea too. Plans can change from day to day; I don't know what can happen tomorrow... I hope you will enjoy the music that comes out of ProSectorium lab as I do!